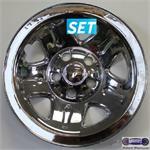 2160a, Used Rims, 16X6, 5 LUG, 100MM, 01-02, CHRY, PT CRUISER. 5 SPOKE W/DIMPLES, CHROME. A=CHROME B= SILVER. 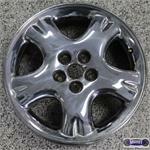 2160b, Used Rims, 16X6, 5 LUG, 100mm, 01-02, CHRYSLER, P T CRUISER, SILVER, 5 SPOKE WITH DIMPLES, ALLOY. 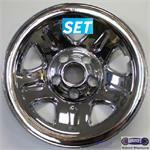 2160b, Used Rims, 16X6, 5 LUG, 100mm, 01-02, CHRYSLER, P T CRUISER, SILVER, 5 SPOKE WITH DIMPLES, ALLOY. A=CHROME B= SILVER.